A rocky planet just 0.57 times the radius of Earth – a little larger than the planet Mars – has been found orbiting a red dwarf star along with two other smaller-than-Earth companions. The planets were detected by the Kepler spacecraft around a 130 light year distant red dwarf star known as KOI-961, and with follow-up observations from the ground-based Palomar Observatory and W. M. Keck Observatory, were found to be just 0.57 to 0.78 times the size of Earth. The new three planet system hosts planets that are all smaller than Earth. Image: NASA/JPL Caltech. Such small sizes imply that they are rocky like our inner Solar System planets Mercury, Venus, Earth and Mars, but orbiting their star in just half an Earth day to two days they are far from habitable; surface temperatures ranging from 200 to 500 degrees between the outermost and innermost planet are too hot to support liquid water. It's not just the planets that are small, either. KOI-961 has a diameter one-sixth that of our Sun’s, making it just 70 percent bigger than gas giant Jupiter. "The really amazing thing about this system is that the closest size comparison is to Jupiter and its [Galilean] moons," says John Johnson, principal investigator from NASA's Exoplanet Science Institute at Caltech. Red dwarfs, small, cool main-sequence stars, are the most common kind of star in the Milky Way – around eight out of ten stars in the Galaxy are red dwarfs – so the new finding suggests that this breed of star could be the place to search for Earth-like rocky planets. 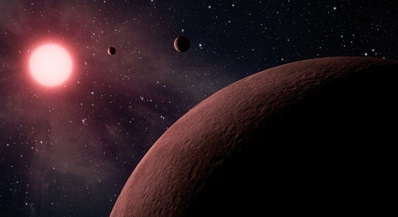 So far only 85 out of 900 potential planetary systems identified by Kepler have been found in red dwarf systems. 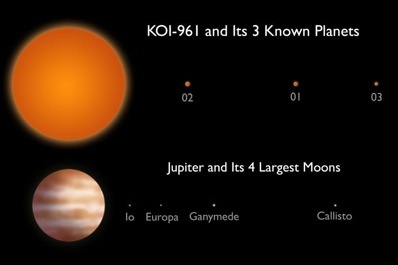 A comparison of KOI-961 and its tiny planets with our own planet Jupiter and its four large moons. Image: NASA/JPL Caltech. KOI-961 also bears striking resemblance to the well-studied nearby red dwarf, Barnard's Star, which is only six light years away. "Barnard's star and KOI-961 are both M dwarfs, which are also known as red dwarfs," says Vanderbilt astronomer Keivan Stassun. "When we compared KOI-961's fingerprint with those of the best known M dwarfs we found that Barnard's star was the best match." While Barnard's Star provided a welcome starting point to derive characteristics of the new Kepler system, it is not known to host planets itself. However, the discovery of another M dwarf that has small exoplanets increases the likelihood that Barnard's star may have planets that orbit at a much greater distance. Since the Kepler spacecraft must spot the tell-tale dip in brightness of a star as a planet passes in front of it, temporarily blocking a tiny fraction of its light, three times before it is highlighted as a planet-bearing candidate, the longer the planet's orbital period, the longer it takes to discover. “If these planets are as common as they appear – and because red dwarfs themselves are so common – then the whole Galaxy must be just swarming with little habitable planets around faint red dwarfs,” adds Johnson.